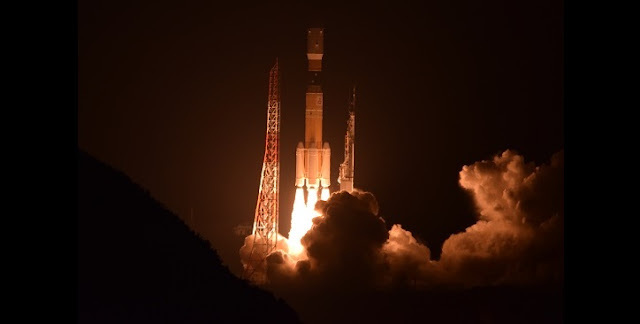 Japan’s sixth H-II Transfer Vehicle (HTV), also known as “Kounotori” (“White Stork” in Japanese) has successfully launched atop an H-IIB booster carrying essential cargo for the International Space Station (ISS). The rocket lifted off on Friday, Dec. 9, at 10:26 p.m. Japan Standard Time (13:26 GMT / 8:26 a.m. EST) from the Yoshinobu Launch Complex at the Tanegashima Space Center. The HTV-6 spacecraft is delivering almost six metric tons of “Christmas goodies” in the form of necessary supplies and equipment for the station. Although the Dec. 1 failure of the Russian Progress MS-04 cargo craft has not jeopardized ISS operations, the Japanese vehicle is carrying much-awaited consumables and some important hardware. The Japan Aerospace Exploration Agency (JAXA) started preparations for the mission in June as the HTV-6 spacecraft was initially scheduled to be launched on Oct. 1. In early June, the agency started installing the payload on the vehicle’s compartments and began to assemble the cargo craft. However, the mission campaign was interrupted in early August when a slight leak was detected from piping of the spacecraft during an air tightness test. Therefore, on Aug. 10, JAXA decided to postpone the launch, not revealing the new date as the vehicle needed to be disassembled and it was difficult to assess how much time would be needed to resolve the issue. When the problem was solved, JAXA announced on Oct. 7 the new date for liftoff, targeting Dec. 9, with the launch window extending till year-end. Preparations for the mission were then resumed and the engineers focused on the assembly of the H-IIB launch vehicle as well as on the encapsulation of the spacecraft in the payload fairing. Once completed, the upper composite consisting of the cargo vehicle and the protective fairing was installed onto the rocket. A busy November schedule culminated in final pre-flight checkouts of the launch vehicle which was then cleared for its rollout to the launch pad. Once on the launch site, the rocket’s fueling operations began a few hours before the planned liftoff. Meanwhile, the teams conducted last checks of the electronics and flight control systems to make sure that everything will work just as expected during launch and flight. The multi-hour countdown campaign entered its conclusive phase about 60 minutes before the launch. During this last pre-flight hour, final reconfigurations of the spacecraft were started in order to prepare it for the automatic countdown sequence about four-and-a-half minutes ahead of liftoff. Approximately three minutes prior to launch, control over the mission was handed to computers and the launcher was switched to internal power. Next, the two LE-7A engines of the rocket’s first stage were ignited five seconds before liftoff. At T–0, the quartet of A3 Solid Rocket Boosters (SRB) came to life providing 2,305 kN of thrust each. Powered by six engines overall, the H-IIB rocket soared into the sky, thundering off the launch pad. The launch vehicle completed a short vertical ascent before performing a pitch and roll maneuver and turning southeasterly. The four A3 SRB boosters provided additional thrust for almost two minutes of the flight until they ran out of propellant and were jettisoned a few seconds later. The H-IIB launcher continued the mission while powered by its core stage alone for another four minutes until the stage separated nearly six minutes into the flight. Meanwhile, the protective payload fairing was detached at T+3 minutes and 42 seconds, unveiling the HTV-6 spacecraft in its full glory. When the rocket’s first stage finished its job of taking the cargo vehicle to an altitude of about 114 miles (184 kilometers) and was detached, the second stage took control over the mission, igniting its one LE-5B engine. The second stage commenced an engine burn lasting for eight minutes and 13 seconds. This stage was responsible for the insertion of the HTV-6 spacecraft into its initial orbit, some 186 miles (300 kilometers) above Earth’s surface. It successfully deployed the vehicle into the planned orbit about 15 minutes after launch. After separation, the HTV-6 switched on its subsystems and initiated communications with the HTV Mission Control Room at the Tsukuba Space Center via NASA’s Tracking and Data Relay Satellite (TDRS) system. The spacecraft will now cruise for three days to reach the vicinity of ISS at an altitude of about 250 miles (400 kilometers) and is expected to be berthed to the station’s Harmony module on Dec. 13. The spacecraft will approach the ISS from below and slowly inch its way toward the complex. Then NASA’s Shane Kimbrough and ESA’s Thomas Pesquet aboard the orbital outpost will operate the station’s Canadarm2 robotic arm in order to reach out and grapple the cargo craft and install it on Harmony, where it is slated to spend more than five weeks. The HTV-6 spacecraft will deliver a total of 5.9 metric tons of payload. Inside the vehicle’s pressurized compartment, there is 3.9 metric tons of cargo. This includes 600 liters of water, food, crew commodities, a Carbon Dioxide Removal Assembly, and a number of experiments. Additionally, high-definition (HD) and 4K cameras, a new Small Satellite Orbital Deployer, along with seven CubeSats are aboard. In the unpressurized section of the spacecraft are six lithium-ion batteries and their associated adapter plates that will replace the station’s current nickel-hydrogen batteries. Each of the new batteries is equivalent to two of the current batteries; therefore, the six lithium-ion will replace 12 nickel-hydrogen batteries out of the 48 in total on the ISS. Two astronauts are scheduled to go out on two, possibly three, spacewalks in January in order to replace the batteries. Nine of the 12 old ones will be stowed in the unpressurized section of HTV-6 to be disposed of upon the destructive re-entry of the craft. The other three replaced batteries will remain on the space station. With a mass of 10.5 metric tons, the soda-can shaped HTV-6 spacecraft is about 33 feet (10 meters) long and 14.4 feet (4.4 meters) in diameter. Built by Mitsubishi Heavy Industries in Japan, the vessel consists of two logistic carriers, the Pressurized Logistics Carrier (PLC) and the Unpressurized Logistics Carrier (ULC), which also includes the Exposed Pallet (EP), as well as an Avionics Module and a Propulsion Module. It also features the Japanese Experiment Module (JEM), known as “Kibo” (“Hope” in Japanese), which is equipped with antennas, reflectors and a Proximity Communication System (PROX) that enables inter-orbit communication with the HTV as the spacecraft approaches the ISS. HTV-6 features a number of changes compared with the previous Kounotori vehicles. The number of primary batteries on the spacecraft has been reduced from seven to six. Solar cell panels have been reduced to 48 from the previous total of 49. Additionally, some navigation and position lights have been omitted, specifically the Earth-side lights during the ISS approach. The Exposed Pallet, inside the unpressurized section, has been strengthened to hold 1.9 metric tons, from the previous 1.6 metric tons, to carry the lithium-ion batteries. There are also two built-in technology demonstration payloads: SFINKS and KITE. SFINKS stands for Solar Cell Film Array Sheet for Next Generation on Kounotori Six. This will test thin film solar cells in space. KITE stands for Kounotori Integrated Tether Experiment. After the spacecraft departs from the ISS, it will test an experimental 700-meter electrodynamic tether with a 20-kilogram end-mass. A maximum of 10 milliamps will run through this tether as HTV’s ISS rendezvous sensor measures how the end-mass moves during the test. The experiment will run for about a week, after which the tether will be separated to prepare for the spacecraft’s de-orbit maneuvers. The goal of KITE is to demonstrate both the extending of an uncoated bare-tether and how it generates electrical current. Both technologies could someday be used to help remove space debris. Besides HTV-6, a swarm of CubeSats is piggybacking on today’s mission. The list of tiny spacecraft includes several Japanese technology demonstrators: the EGG, developed by the University of Tokyo; an Italian amateur radio satellite named TuPOD; a small U.S. spacecraft for technology demonstration purposes known as OSNSAT; and a Brazilian technology demonstrator called Tancredo 1. All the CubeSats will be deployed into space at a later date. The H-IIB rocket that was used in Friday’s launch is a two-stage launch vehicle derived from the H-II rocket of the 1990s. Standing just slightly taller than both rockets in the H-II family at 183.7 feet (57 m), it uses the standard liquid oxygen and liquid hydrogen propellant formula. First flight of the H-IIB booster was conducted in September 2009 when it launched the maiden HTV-1 spacecraft to the space station. This was the sixth flight of the H-IIB Launch Vehicle to date. Two variants of the H-II were developed, including both the H-IIB and the H-IIA, which first flew in 2001. While the H-IIA has been the workhorse of Mitsubishi Heavy Industries, the H-IIB is specifically designated for HTV launches to the ISS. Friday’s mission was the third orbital launch for Japan this year. JAXA’s next launch is also slated for December – on Dec. 20, it will launch its Epsilon rocket carrying the ERG research spacecraft into space designed to study Van Allen belts.